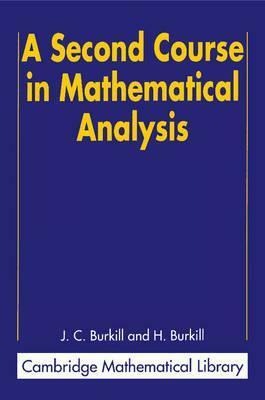 The classic analysis textbook from Burkill and Burkill, now available in the Cambridge Mathematical Library. This straightforward course, based on the idea of a limit, is intended for students of mathematics and physics who have acquired a working knowledge of the calculus and are ready for a more systematic treatment. The treatment given here also brings in other limiting processes, such as the summation of infinite series and the expansion of trigonometric functions as power series. Particular attention is given to clarity of exposition and the logical development of the subject matter. This, combined with the large number of examples included, ensure that this book will appeal to students of analysis. 1. Sets and functions; 2. Metric spaces; 3. Continuous functions on metric spaces; 4. Limits in the spaces R and Z; 5. Uniform convergence; 6. Integration; 7. Functions from Rm to Rn; 8. Integrals in Rn; 9. Fourier series; 10. Complex function theory; 11. Complex integrals, Caucy's theorem; 12. Expansions, singularities, residues; 13. General theorems, analytic functions; 14. Applications to special functions.